When I worked in retail, I couldn’t tell you how many times I heard shoppers say that the holidays “snuck up on them too quickly.” I would always laugh because… well, they’re the same days every year— besides Hanukkah, of course, but at least same season! The fact of the matter is, there’s always that one present you forget to pick up. Fear not! There are a ton of great finds on Amazon that are eligible for 2-day shipping that would work for anyone on your list. No need to spend hours scrolling— I already did that for you. 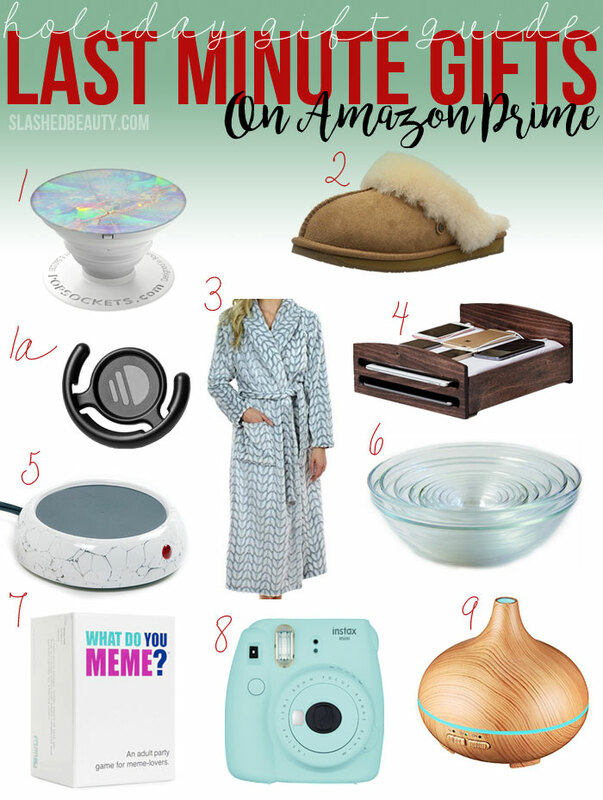 Keep reading to discover 10 last minute holiday gifts on Amazon Prime that will totally make it seem like you didn’t buy it just a few days before the party. Click the picture of the product to find it on Amazon. This was the best $20 I ever invested in terms of my smartphone. Popsockets are retractable kick stands for your phone that also help you keep a tight grip on it to reduce drops. Using the Popclip, you can mount it anywhere from your car to your fridge. After upgrading my device, this was the first accessory I bought. Everyone can appreciate a comfy pair of slippers— especially in the cold months. These have a foam-cushion insole with shearling lining for ultimate comfort, and the rubber sole makes them suitable for both indoor and outdoor use. Another cozy gift that will be appreciated this season, this robe is great for lounging and binge watching. The outside features a plush raised pattern while inside you’ll find a soft solid color. It’s long enough to keep your legs warm and pairs perfectly with the slippers if you want to go all out! For the tech-crazy who’s always looking for an outlet, this charging station gives your gadgets a place to rest and recharge while you do the same! Plug in all your smartphones, tablets, and anything else that needs a USB connection to fill up on battery life. This is a great gift for a coworker or someone you know who is always at their desk. This decorative coaster actually keeps your mug warm so your coffee or tea is always at the right sipping temperature. This is one of the most-used gifts I have in my kitchen. We use them for prep, for salads, for big bowls of ramen and for DIYs. No kitchen is complete without them. Great for people who’ve just moved into a home or love cooking/baking! One of my new favorite games at game night, What Do You Meme? is like Cards Against Humanity but for internet-lovers. Each player has a set of cards with funny captions, and they submit their best to whatever the round’s meme photo is. Funniest caption wins! For the budding photographer or crafter, this polaroid camera makes capturing moments the old-fashioned way fun. The bundle comes with frames, filters, a camera case and other accessories to make the most of your new everywhere companion. Transform any space into a tranquil relaxation zone with this essential oil diffuser. The wood grain pattern makes it a great accent for home or office, and it doesn’t take up much table top space at all while filling a room with great scents and aromatherapy benefits. Are you grabbing last minute holiday gifts for anyone on your list?